Inkjet Printer Reviews are extremely useful in helping you pick the best inkjet printer that meets your unique needs. Inkjet printing technology has become the standard in colored document and photo printing. Top printer manufacturers are in the race to offer the best inkjet printers, resulting in a cluttered inkjet printer market, which can cause quite a headache for those looking for an inkjet printer. If you are shopping for one, don’t be surprised if you get confused because of all the inkjet offers in the market. Your best guides would be inkjet printer reviews, which help identify which printers offer the best value and performance of all. Here are some of the inkjet printers that deserve special attention. Canon’s Pixma printer series is often dubbed as the best inkjet printing technology around, boasting of an extensive list of inkjet printers that print using 1-picoliter ink droplet size through its patented ChromaLife100+ and FINE or Full-photolithography Inkjet Nozzle Engineering print head technology, which went beyond the limits of basic inkjet printing. With these technologies, Pixma printers can print borderless photos at 9600 x 2400 dpi resolution in just around 20 seconds, but the photos can last up to 300 years. The printers are also equipped with flexible connectivity with its built in memory card, USB, and camera connections. The series includes basic printers and all in ones, most of which rate high in inkjet printer reviews. So if you are looking for a general inkjet printer, you should get one from the master inkjet series. 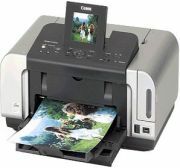 And the Canon Pixma iP4600 would make a great choice with its affordable $150 price tag, which already offers you lab-quality photo prints and sharp document prints. It comes with an Auto Photo Fix software, a Quick Start feature, and a sleek and quiet design that’ll look imposing on any desk. But if you need an inkjet printer that will be used in an office with multiple users, you need a machine built to handle multiple and complex print jobs at fast speeds and can provide networking freedom. Inkjet printer reviews commend the HP OfficeJet Pro series for coming up with exactly this type of printer. The OfficeJet Pro inkjet printers can print at top speeds, breaking records with its 36 ppm black and 35 ppm color printing. All OfficeJet Pro printers are ready for Ethernet and WiFi networking, and most come with high-capacity paper trays for continuous, multiple-user printing. All these features in just one printer? That printer would certainly cost a lot. But not with one of the most affordable OfficeJet Pro printers, the K5400dtn. At just under $250, you get speedy, high quality inkjet printing that can be shared by all members of your organization, and can actually keep up with all the print jobs thrown its way. The Epson Stylus is Epson’s inkjet series, which offers an extensive and highly impressive collection of top-of-the-line printers that inkjet printer reviews often rave about. Focusing its efforts on precise and premium photo printing, the Epson Stylus line has become a popular choice for those shopping for photo printers. Epson Stylus inkjet photo printers are widely praised for their vibrant high-res prints using Epson’s high-quality inks such as the six individual-cartridge water, smudge, and fade resistant Claria Hi-Definition Ink. Photos printed on a Stylus printer can last for up to 200 years. If you want this print quality but is willing to forego all the added features to get a good price, the $250-$280 Epson Stylus Photo 1400 is exactly what you’re looking for. The inkjet technology has become a very important pillar in the printing industry. The inkjet printing technology use droplets of ink to print images onto any page; the precision at which details are captured generally depend on the quality of ink used and the size of the ink droplets. Top brands Canon, HP, and Epson are the best inkjet printer manufacturers that enjoy much of the market share for inkjet printers. Inkjet printers use inexpensive ink, does not require warm up times needed by thermal wax and laser printers, and results to lower cost per page overall. Inkjet printers are also more keen to the details in your images, making them excellent graphic and image printers. Good luck with picking the best inkjet printers. PDF Printer - Expanding Your Printing Horizons - A PDF printer is becoming an increasingly valuable equipment at home and in the office.